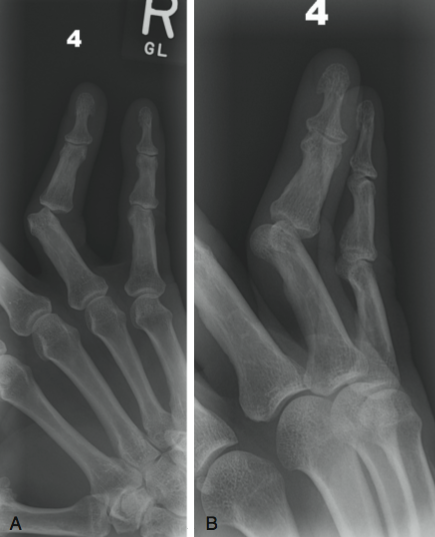 Dislocation of the Finger Joints Handout | Dr. Thomas Trumble, M.D. These occur often in sports injuries or from a fall. The most common injury is a joint in the middle of the finger, called proximal interphalangeal (PIP) joint (figure 1-2). There is pain, swelling, and inability to bend the finger. Often these injuries are overlooked as a minor sprain, but days or weeks later the patients notice that they have limited motion of the finger. Who has PIP Joint Injuries with Dislocation or Partial Dislocation with Sublixation? These can occur in individuals at any age, although much more rare in pediatric patients because that the growth plate causes a different pattern of injury. These often occur in sports injuries where the fingers are caught, twisted or hyperextended. How do we diagnose PIP Joint Injuries? Clinical examination is extremely important. Stress tests under x-rays can show whether there is looseness or laxity of the joint. Occasionally an MRI is necessary to identify ligaments that have ruptured and healed, but in a poor position so that there is edema or swelling in the damaged ligament. How do we treat PIP Joint Dislocations or Ligament Injuries? The vast majority of these can be treated with hand therapy where the finger is buddy taped to an adjacent finger and early motion is started. These often benefit from a cortisone injection to help relieve the thickened scar tissue and improve the patient’s ability to progress with therapy. (Refer back to Figure 1). These can require surgical repair where special bone anchors are used to reattach the ligament back down to the correct anatomic site of the bone (figure 2). Following either the buddy taping and splinting or the surgery, it is necessary to have the early range of therapy program. The PIP joint is very prone to stiffness as it is a beautifully designed joint with minimal tolerance for any type of scar tissue. In general, the patients can expect excellent recovery of motion and strength following these injuries. It is important to prevent re-injury during the recovery process.